We just finished a 4-day stretch of haying and we are whupped. As always, it was satisfying beyond any logic or reason. We pulled the last few bales off the field yesterday afternoon just as the rain started falling, and it felt like someone was trying to tell us it was time to rest. The following is excerpted from an essay I wrote last year. It will be published in an upcoming issue of Yankee magazine. On haying days, Penny mixes thick milkshakes and we drink them on the ride home, the four of us crammed into the cab of our old Chevy. We idle down the winding gravel road from Martha’s hayfield; the loaded wagon pushes us, and I ride the brakes. Oncoming traffic gives us a wide berth, and wisely so. Everyone waves in that two-fingers-off-the-steering-wheel way rural Vermonters wave, as if afraid to commit to even this brief, passing relationship. I can smell the warm hay, the hot brakes, and the chopped up sprigs of mint Penny puts into the sweet slurry of cream, egg, and maple syrup. I can smell the sweat that has risen, flowed, and is now drying on my skin. It is not sour, or at least, not yet. My teeth hurt from the cold, and I know that my day is nowhere near over. There is this wagon to unload, and yet another to fill. There will be more tomorrow. 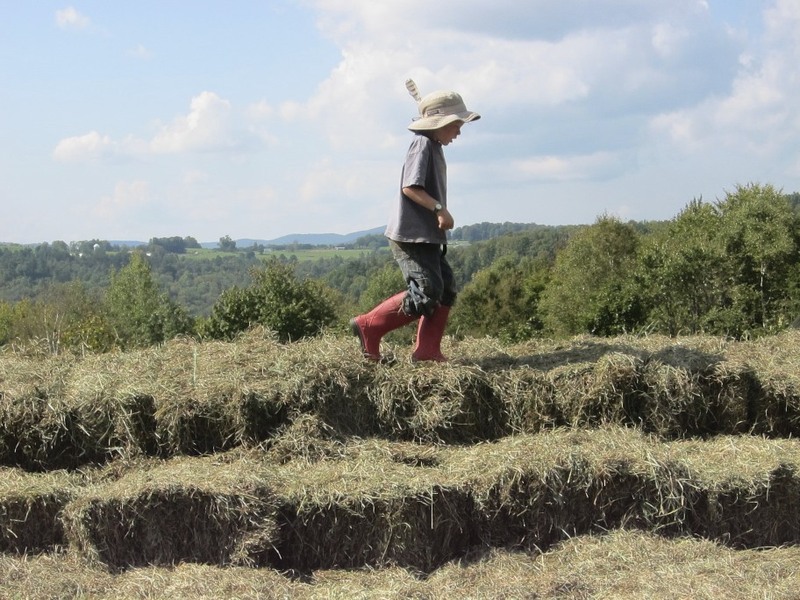 But for the seven or eight minutes it takes to get home, I am afforded the simple luxury of the satisfaction only hard labor can provide, and I think ahead to the coming winter, when I will pull each of these bales out of our barn, one-by-one, extracts of summer in an iced-over world. And I will remember how it happens every year that I improbably recognize a bale or two – maybe a runt from an early pass, when we were fiddling with the baler settings, or maybe one from the field’s edge, with an identifying stick woven in, shed from the old maples that line the northern fringe, overseers of more hay and toil than I can imagine. And I’ll stand in our snow-packed barnyard for a minute, holding the bale, wrenched back to the moment I hauled it off the chute and tossed it to Penny or one of the boys as Martha guided the tractor down the long windrow, the smell of grease and diesel and drying hay riding softly on the summer air. It’s not a moment frozen in time, but rather just the opposite: A moment so fluid it can travel across weeks and even months to be with me at six o’clock on a January morning, to a point roughly equidistant from the haying season before and the haying season to come. Then I walk up the short hill to the paddock, release the compressed hay from the confines of its twine, throw it over the fence, and leave the cows to their breakfast. The thought of a moment in time which can be experienced again later is beautiful — thanks as usual for your thoughtful writing. This one gave me chills as I read it. Beautiful indeed, and perfectly described. Yes! That is EXACTLY how it is. Hi – just wanted to say what a lovely couple of hours I’ve had reading your “stuff”. Ben, a couple things come to mind. One is the Hayden Carruth poem, Emergency Haying, about the poet haying with his friend Marshall. Another is a memory of haying with a French-Canadian family in Westfield in 1975. It was a family affair, and the in-laws were down from Quebec. I was up in the haymow with the father-in-law who was in his 70’s. I was in my mid-20’s and passing him the hay, going as fast as I could just to show I could do it. At one point, he turned to me and quietly and kindly put me in my place, “Damn it, don’t rush me, we are going to do the same amount of work, if we are here 8 hours or 12 hours.” In the years since, I have turned that experience, and its insight over and over in my mind; be present to the task at hand and let it unfold in its own way. Doug, that’s a great poem, as are most of Hayden’s. He was a close friend of my parents; his work was always kicking around our place when I was growing up. My favorite of his: Cows at Night. I bet you know it. Also loved your anecdote, especially being one of those folks who’s always trying to cram 12 hours worth of work into 8.